As an act of gratitude to the Seribu Islands' 17th anniversary that falls on November 9, around hundreds of orphans in six urban village in Seribu Islands get compensation aid.
" 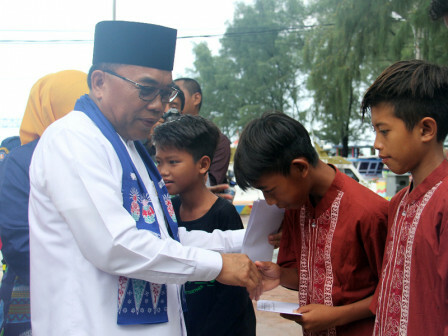 Compensation aid is given to 396 orphans"
"Compensation aid is given to 396 orphans," said Husein Murad, Regent of Seribu Islands, Friday (11/9). The compensation itself is from all state civil apparatus (ASN) employees under Seribu Islands District. "Especially for children outside Pramuka Island, the aid will be delivered through each urban village," he exclaimed. He also appeals to all people keep supporting the program of the government development. It is because it will have a positive impact on the people of the Seribu Islands. "Today is different from 17 years ago and a lot has changed. I hope people continue to participate in developing the Seribu Islands," he stated.